If your piano is exposed to high fluctuations in humidity I would advise you to have a Dampp Chaser® piano climate control system installed. This system will extend the life of your instrument, and also help it to retain its tuning between appointments. The air inside most homes is very dry during winter months because heat tends to dry out the air. Click this link to find out more about the benefits of piano humidification. The ideal humidity level for a piano is 42%, and anything below 35% or above 55% will have a negative impact on your piano. You may notice sluggish keys or other problems. If you like keeping windows open during mild the months of the Spring or Fall seasons, it can really take a toll on tuning stability, not to mention corrosion on the strings, and the effect of humidity on felt and wooden parts. Click on this link to find out more about the benefits of piano dehumidification. In fact, I would not at all recommend opening a window in the room where the piano resides, unless the humidity level outside is below 60 percent. 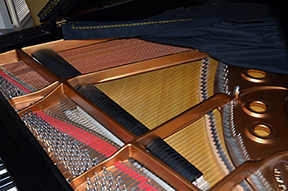 The Dampp Chaser® Piano Life Saver® system has been proven to be most effective for both upright and grand pianos and provides a stable environment inside you piano throughout the year. Click on Grand or Upright for more information specific to each system. 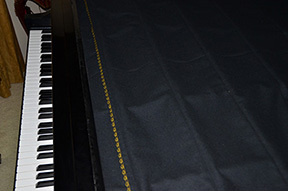 As your piano technician, I am able to procure and install the system most suited to your piano and the climate in Northern Virginia, as well as activate the 5 year warranty provided by Dampp Chaser® Corp.
For grand pianos, I also recommend getting a string cover, such as the one pictured on this page. It does not have a significant impact on tone quality, but will help keep your piano free of dust, and also aid in humidity control. This is because it provides a buffer between humid air in the room, and the air sandwiched between the strings and the string cover. A string cover is especially helpful if the piano lid is often open, even if it is just front part where the music desk resides.